Ageless. Legendary. Unstoppable. Leander Paes is all that and more. In a professional career spanning 25 years, Leander has carved out a very special niche for himself in the world of doubles tennis. After his US Open mixed doubles triumph with Martina Hingis, Paes summed up his entire mindset very simply, saying, "My whole life has been about perseverance. About just trying to find a way to succeed." No one was waiting for the 42 year old to win his third Grand Slam title of the year to give him the tag of 'legend', but his 17th Grand Slam title did help Leander re-write history. Paes now has the most mixed doubles Grand Slam titles for a male player with 9. He is in fact just one title short of the overall record of 10 held by Martina Navratilova. The Leander-Martina (Hingis) combine is in fact turning out to be a dream combination. The Indo-Swiss pair has won 3 of the 4 Grand Slam mixed doubles titles this year, making them the first pair to do so since 1969. 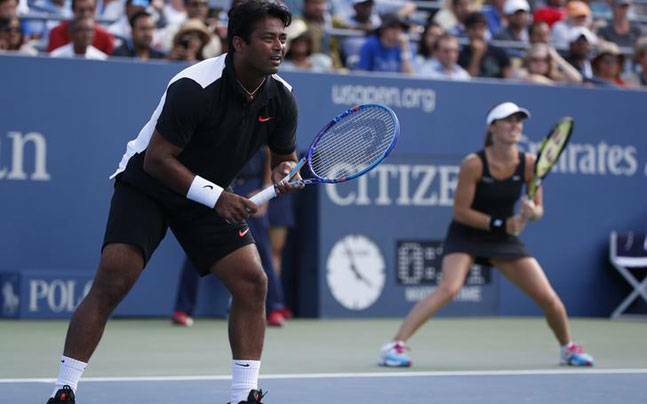 Leander and Martina have won the Australian, Wimbledon and US Open titles this year and that makes 2015 Leander's most successful year since 1999, when he won two men's doubles and one mixed doubles title. The 16 year gap proves yet again that the 42 year old is showing no signs of slowing down. Leander himself sounded very proud of his achievements with Hingis, saying, "We won the Australian Open without losing a set, which I thought was pretty phenomenal. Then we go to Wimbledon and win that without losing a set. I thought that was pretty cool." Overall, Leander has played with 24 partners in the mixed doubles draw, but it's safe to say that Hingis is one partner Leander wouldn't want to part with. Hingis, of course feels the same way about Leander. The Swiss ace in fact said, "Right now I feel we are almost invincible going on court. I think we have that extra point when we walk on court. We have a little bit of that aura, that they have to come up with their best to beat us." Interestingly the other Martina i.e., Navratilova is also someone Paes has partnered and won two Grand Slams with. Overall, Leander now has 17 Grand Slam titles. He is of course the most successful Indian tennis player, with the most number of Slams under his belt. The past has been great. The present is looking very good. The future promises immortality.